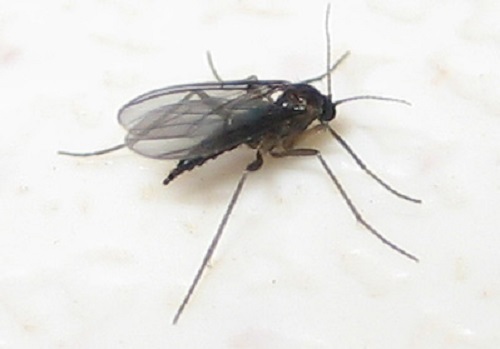 For gnats, the life cycle of only a few species has been studied in detail, typically with those that are considered pests to the mushroom industry. For these species, the female will usually lay about 200 eggs, of which about 90% are female. The larvae will begin to emerge after about a week and they will feed on fungi, rotting organic material and animal feces. They play an important role in turning forest leaf litter into soil. [x] They will then metamorphose into pupae, a stage which lasts about another week. After this, they develop into adult gnats and have a fairly short life-span, lasting for only about another week during which time the females will mate and once again lay eggs. [xi] The life cycle of the fruit fly is commonly around 30 days, but it has been shown that their lifespan can be increased to 3 months under the right conditions. Females commonly lay approximately 400 eggs which will hatch after about 12-15 hours and the larvae take about four days to grow while feeding on microorganisms that decompose the fruit as well as the sugar content of the fruit itself. After that, the larvae they metamorphose into pupae for another four days after which time, they will once again emerge, this time as adults. Between eight and twelve hours after emerging, the females will become receptive to mating and will lay eggs beginning the cycle again. Rikki Roehrich. "Difference Between Gnats and Fruit Flies." DifferenceBetween.net. November 8, 2018 < http://www.differencebetween.net/science/nature/difference-between-gnats-and-fruit-flies/ >.